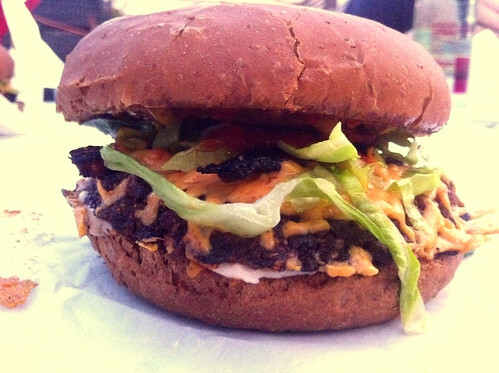 There is a lot of talk about who has the best veggie burger in town, recently I even saw a thread on Reddit about that very topic.Someone mentioned Burger King which made me really sad because we have some fabulous homemade versions in Austin! When Vegans Rock Austin did their best of Austin poll Bouldin Creek’s infamous Veggie Royale won the top honor but Arlo’s came in second which is pretty good for a little trailer that just opened up at the end of last year! Arlo’s Food Truck is an all vegan trailer on east 6th street, just across the way from the Brixton now next door to Cheer Up Charlies and it is fabulous. The owners and workers are super nice and they make just about everything in house. I loved the burger which seemed closer to a meaty steak ‘n’ shake burger than any veggie burger I have ever tried. You can tell it is homemade by the way it looks and you can even see some lentils poking out so it must be healthy. They also have a chipotle burger and a barbecue burger which I haven’t tried but I did get to try the chicken tacos. They were authentic enough with homemade chicken flavored seitan and nice treat after drinking more than I should have at Vegan Drinks. In case you are wondering, yes, I went back to Arlo’s later the same night for tacos after I tried it for dinner. 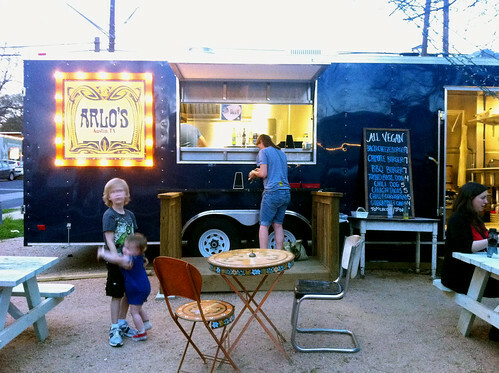 This entry was posted in Austin and tagged Arlo's Food Truck, Austin, Vegan Trailer, veggie burger on February 29, 2012 by lazysmurf. 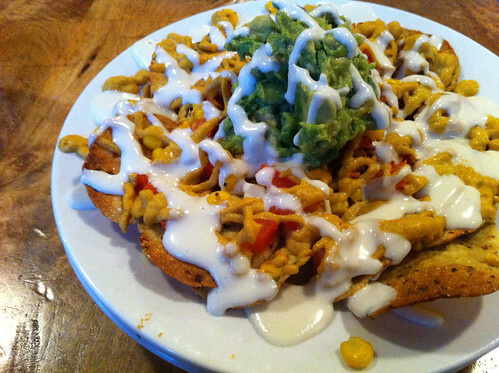 What follows is the best vegan eatin’ in the city and a google map! 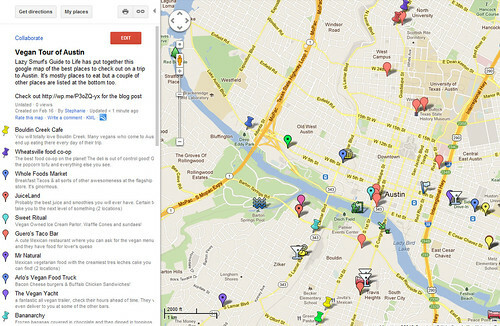 It’s also a part of the larger Austin City Guide. If you want to read a longer vegan guide that includes what do in Austin check out A Vegan Tour of Austin. If you are looking for help with South by Southwest or eating downtown look here. For every vegan option that I know of this is my citywide guide. There are also reviews, and top ten lists. I tried to be concise here which is not my strong point! 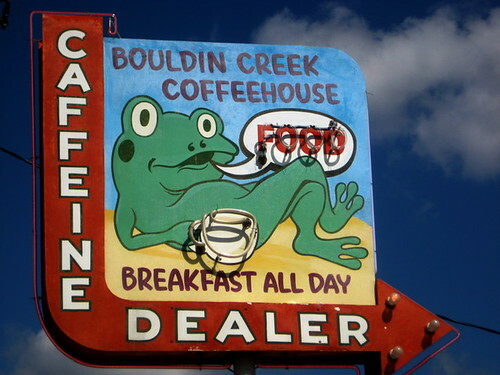 Bouldin Creek Coffeehouse. The last couple of vegans from out of town that I happen to follow ate at Bouldin every day of their trip. Head to Bouldin Creek bright and early before they run out of the rennedict and the brunch lines get out of hand. They have my favorite tofu scramble in the world (you can get it to replace eggs in and dish) and their tofu bacon is surprisingly delicious. Rabbit Food Grocery A couple blocks down at South First and Live Oak you will find Rabbit Food Grocery our super awesome locally owned and operated all vegan store! 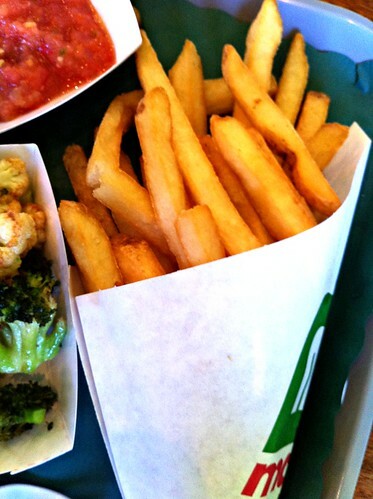 They have tons of vegan items and they are constantly expanding, here is a review. Unity Vegan Kitchen One of my favorite vegan trailers is on Barton Springs road and if you dream of muffaletta sandwiches or cashew cheese lasagna this is the place to be. Wheatsville Co-op. Please don’t blow it off as some campus grocery store, these people know how to cook southern comfort and it is one of the most vegan friendly places I have ever been to. You have to try the popcorn tofu. The best way to do this is in a popcorn tofu po’boy but now they also have buffalo popcorn tofu with blue cheese dressing so it’s a toss up of which is better. You can always stuff a couple extras in your bag for your trip home! They also have my favorite noochy vegan mac and cheese, Red Rabbit donuts, rice krispie treats, black bottom brownies, vegan sushi, frito pie, and a million other things that are all fantastic. You will want to move here like everyone else. BBQ Revolution is the go to spot for smoked vegan barbeque in Texas! Bistro Vonish They are hoping to open a fine dining restaurant soon but for now the trailer will feed you from their seasonal menu with pizzas, kolaches, and an ever changing menu. Whole Foods on 6th and Lamar. The company started a couple blocks away and through the years keeps getting bigger and bigger. I dig the breakfast tacos. 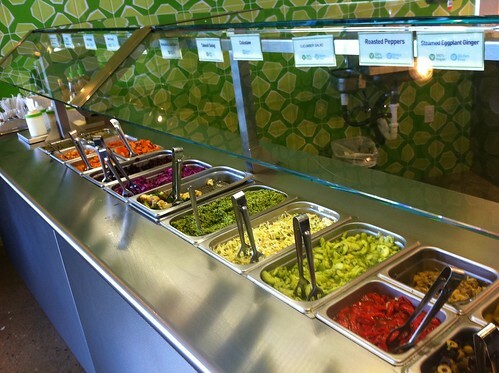 Juiceland, is definitely a spot you shouldn’t miss. Even their regular juices and smoothies will amaze you. I promise. The “next level” and “even further” sections of the menu are where you will find smoothies like “Kaleibrator” which is coconut water, banana, durian, kale, spirulina, pecan butter, hemp seeds, coconut oil . You can totally become a level 5 vegan just by trying it. It is the same deal with the juices, you could try the “Ninja Bachelor Party” pineapple, jalapeno, celery, kale, spinach, parsley, salt. Counter Culture started on North Loop as a vegan trailer but has finally become a brick and mortar restaurant and will soon be the center of veganville on the east side. 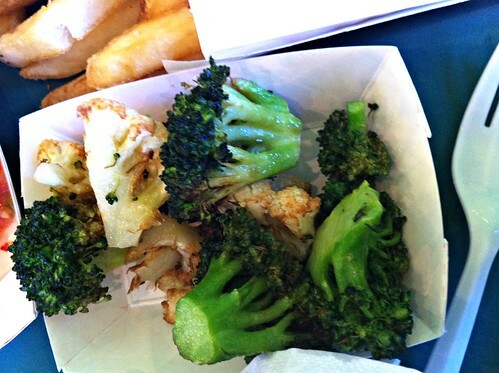 Enjoy their menu which can appease someone following any diet you can imagine from Engine 2 to Gluten Free. I especially love the brunch . Capital City Bakery is also on Ceaser Chavez and should not be missed! Whether you want their light and fluffy cupcakes piled high with frosting or their savory kolaches or monster sized brownies you won’t be disappointed. Sweet Ritual If you want a waffle cone or a glitter sundae you are going to have to go a north to the Daily Juice Cafe where you will find Sweet Ritual and their lovely ice cream stand! They have the best soft serve and the most adorable vegan owners and while you are waiting you can get nachos at the Daily Juice! The Vegan Yacht which is a trailer specializing in non GMO and organic sandwiches and burritos. Everyone loves their Frito Burrito which is a Frito Pie in Burrito form. Here’s a tip, spring for the guacamole, it’s totally worth it. 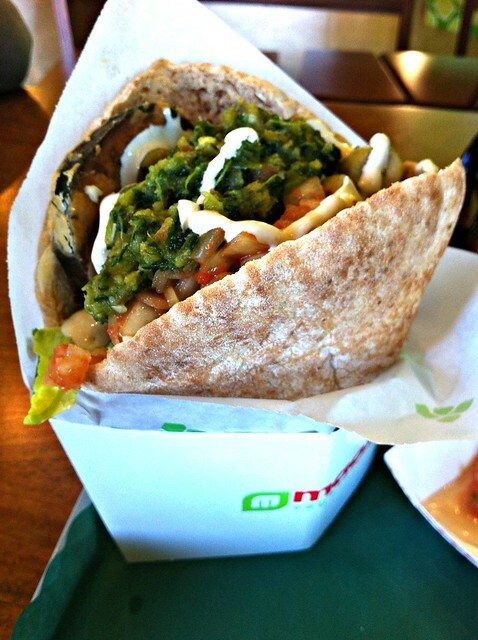 Mr. Natural The perfect place to go for Mexican vegetarian food without a wait. Most things are vegan and they too have buffet where you can select from a couple options. They also have a menu which you are welcome to order off that has everything from crispy tacos to milanesa and soya guisado. You will probably love whatever you try, just make sure that you finish up with the vegan tres leches cake. I love their breakfast, tofu can be substituted in any of the egg dishes. Arlo’s which is all vegan trailer that has items like a Buffalo Chik’n Sandwich and a Bac’n Cheeze Burger. I loved their burger which seemed closer to a meaty steak ‘n’ shake burger than any veggie burger I have ever tried. You can tell it is homemade by the way it looks and you can even see some lentils poking out so it must be healthy. They also have a chipotle burger and a barbecue burger which I haven’t tried but I did get to try the chicken tacos. They were authentic enough with homemade chicken flavored seitan and nice treat after drinking more than I should have at Vegan Drinks. Biscuits and Groovy on 5015 Duval St at 51st St isn’t 100% vegan they probably have more vegan biscuit and gravy options than anyone else in the south since everything on the menu can be made vegan. Try the Gloria Gaynor which has three biscuits, gravy, vegan sausage, tofu scramble, daiya cheese, tempeh bacon, and jalapenos. The Vegan Nom Rockin’ Vegan Tacos. Fantastic breakfast tacos and lunch tacos here. 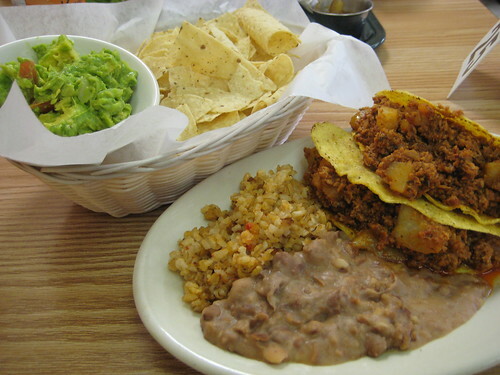 I love the migas taco, the tofu scramble and tempeh, the vegan migas. the fish taco, the sweet potato taco, and really everything I’ve ever had there. Note that it is cash only! Cool Beans Another all vegan tacos stand moving to ceaser chavez and soon to be selling breakfast tacos as well! Casa De Luz– All vegan macrobiotic place, behind Barton Springs on Toomey. A really lovely place with shared tables. Menu changes daily. Hippie food to the extreme. 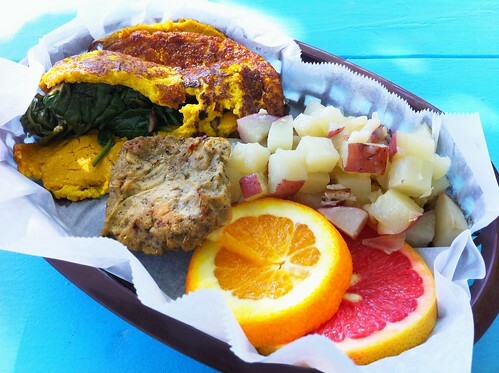 Schmaltz– 913 E Cesar Chavez A vegetarian trailer with Seitan Reubans, Falafel and more. This entry was posted in Austin on February 23, 2012 by lazysmurf. A few months ago Molly from the Lonestar Plate did a fantastic post about the best places to go for brunch in Austin. I had heard her rave about the vegan chorizo from Elsi’s before but after reading more I had to try it as soon as I could make my way to distant north Austin. Elsi’s is a great place to go for brunch because it isn’t so packed you have to wait in line. I asked Molly what specifically to order because they had a fair amount of choices and she recommended a build your own breakfast taco with black beans, soy chorizo, and avocado. I have had a lot of vegan chorizo in my life. In fact, I think it was the first fake meat product I ever tried. But Molly definitely knows what she is talking about here. Unlike every other version of vegetable chorizo I have tried this one was actually made with vegetables! It had little bits of onions and pepper cooked right in it. It was also a little less greasy than many of the versions I’ve tried. The only thing missing on my taco was some fried plantains. Next time! And here is a true story: this morning I wasn’t feeling so well and then I had a taco and then I felt fine! Great even! Full of energy and ready to start my day. 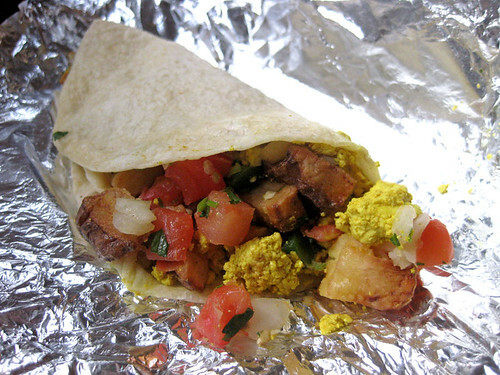 Breakfast tacos do have some known healing qualities but now I think there is a good chance that they can SAVE LIVES! I’m thinking about writing a book, “A taco a day”. I’m sure it will be a best seller although clearly am going to need more personal anecdotes. 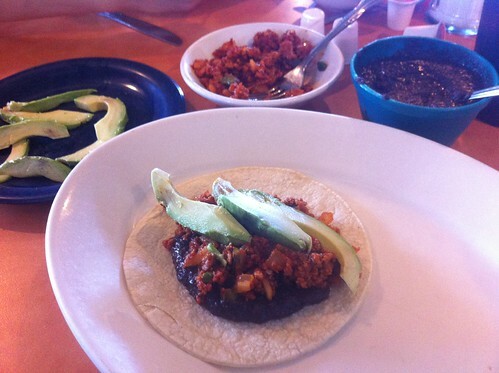 This entry was posted in Austin and tagged Austin, breakfast tacos, Elsi's, North Austin, vegan breakfast tacos on February 20, 2012 by lazysmurf. I used to never really celebrate Valentine’s Day except to make a fancy dinner. Well, there was the one year that Dan bought be “The Bodyguard” which you should totally watch. Some would say it’s the greatest love story of our time. Anyway, now that I am in my thirties I am totally digging all the girly things I never cared about before. I wonder why? 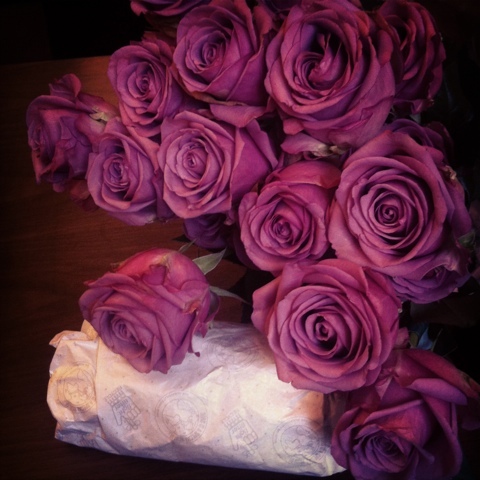 Dan brought me flowers and a breakfast taco first thing in the morning! Best present ever! 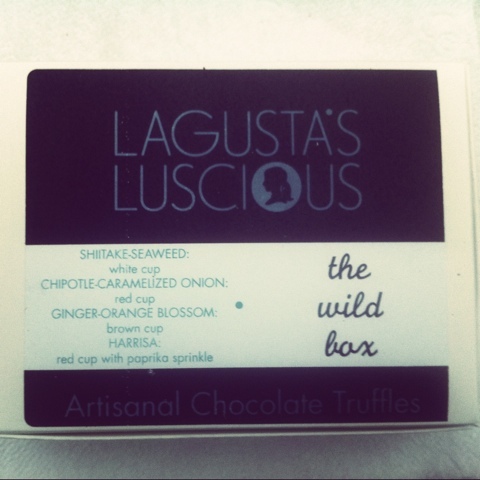 I got fancy Lagusta truffles that have the craziest flavors. I had to try “the wild box”! So far my favorite was the chipotle carmelized onion. Who would have thought onion chocolate would be so great. Dan hated the shitake one though so that was sad. Next time I’ll go for something less wild. 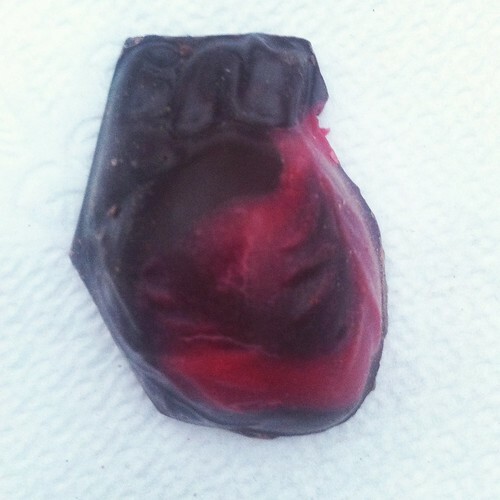 The intense chocolate hearts with dried cherry and black salt were truly amazing. 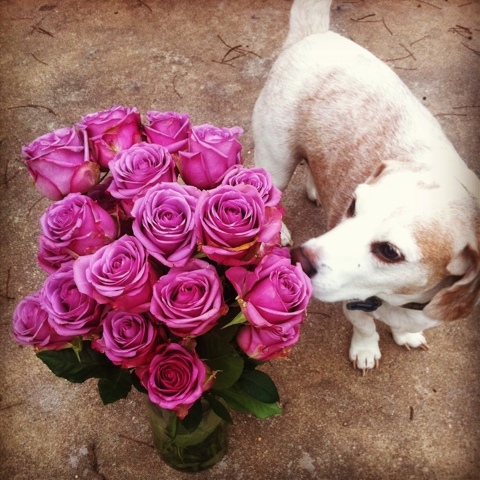 Even Dinger liked the flowers although he would have liked them better if they smelled like nooch. 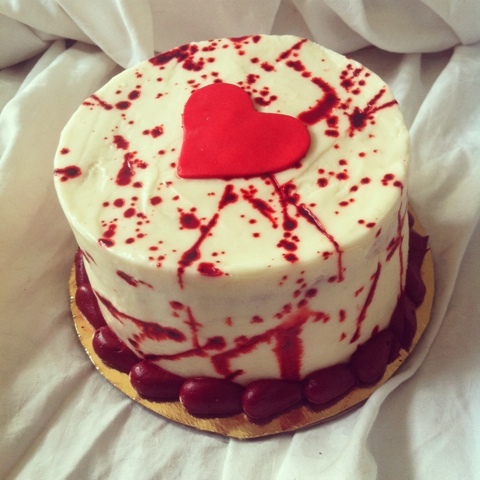 Then we got an adorable little red velvet cake from Sugar-Skull. 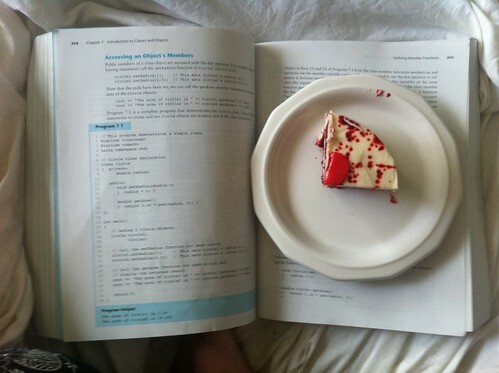 Now I am studying for a test (aka procrastinating by blogging about my pretty pink Valentine’s Day. 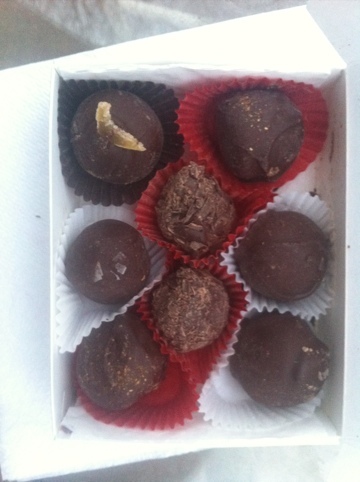 This entry was posted in Austin and tagged Cake, chocolate, Lagusta, vegan on February 15, 2012 by lazysmurf. 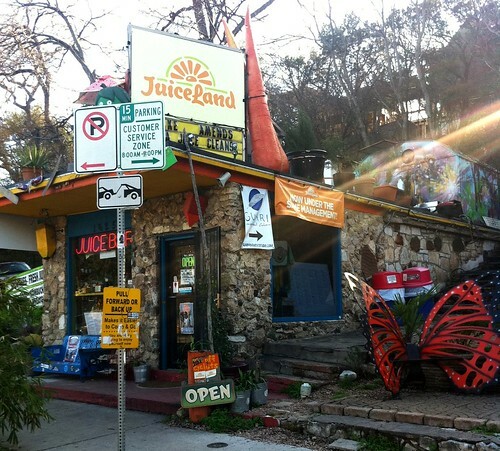 A lot of people have been wondering what the deal is and why the Daily Juice on Barton Springs and Lake Austin Blvd turned into Juiceland. 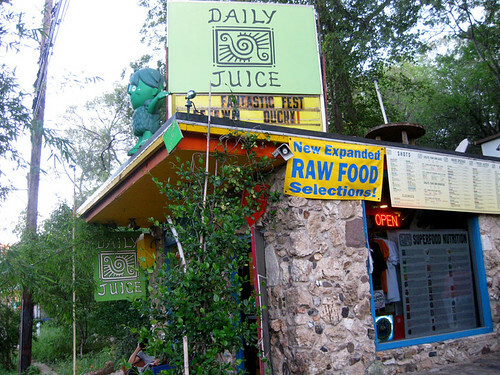 From what I understand, two guys opened the original Daily Juice pictured above on Barton Springs, Matt Shook and Keith Wahrer. 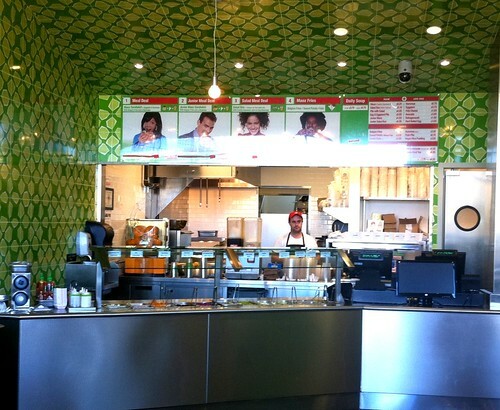 Keith wanted to franchise into even more locations and Matt didn’t so Matt retained ownership of the first two locations and changed the name to Juiceland while Keith kept the Daily Juice Cafe in Hyde Park and plans to open more all over town. I think the split has actually been a great thing. I was already obsessed with the Matt Shook / soup peddler run Juicebox. I do love smoothies and the green smoothies at the Juicebox are the best I had had, I even put the green monster on my 2011 top ten. Since the Juicebox is close to home it took a twitter deal for half off to finally bring me to Juiceland and now I have returned several times. Their old menu wasn’t very inspiring to me, regular fruit smoothies are something I usually just want to make at home. But the new menu is so much more delightful! Both the smoothies and the juices are divivded into sections like fruit, green, protein and dessert. This is really nice and helpful, their line up of green smoothies is super exciting and I don’t remember them even having any before. I just tried the Tikal the other day and at Lake Austin location and it had pineapple, papaya, ormus supergreens, and lime. It was so tropical and delicious! Even more appealing is the “next level” and “even further” sections of the menu. This is where you will find smoothies like “Kaleibrator” which is coconut water, banana, durian, kale, spirulina, pecan butter, hemp seeds, coconut oil . Can you believe it!?! You can totally become a level 5 vegan just by trying it. It is the same deal with the juices, you could try the “Ninja Bachelor Party” pineapple, jalapeno, celery, kale, spinach, parsley, salt. Plus, they have ready-made takeaway which, I think, have gotten so much better than the all raw creations of the past. 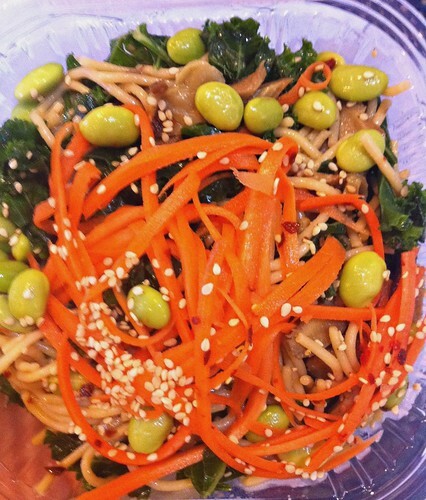 I have really been enjoying the soba noodle, kale & edamame bowl. It is surprisingly tasty and really filling. They also have a ton of vegan food stuffs like power bars, energy bars, fruit bars, kale chips, and even homemade soup from the Soup Peddler. If you are looking to go on a juice diet you can buy their special blends by the gallon and not just the Master Cleanse, but their own signature blends like Unicorn Blood which has Watermelon, Beet, Celery, and Ginger or the Tri Pinnacle which has Coconut Water, Avocado, Spinach, and Kale. How the hell do you juice an avocado anyway? I don’t know but Juiceland has found away. On the other hand, the Daily Juice has kind of gone in the opposite direction, they stopped being all raw and added items like vegan nachos and the Sweet Ritual vegan ice cream shop opened up inside. 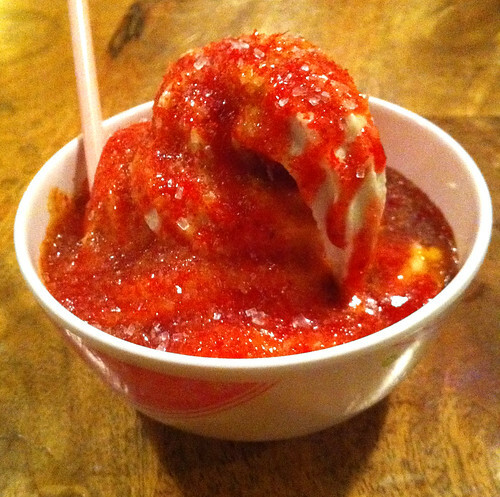 Unfortunately, they also added dairy cheese so make sure to specify when you go. So that’s the story. Don’t worry about going to Juiceland, it’s still mostly run and filled with hippies and the super active people that populate such establishments so I promise it will be completely non-threatening, non-corporate and satisfying. 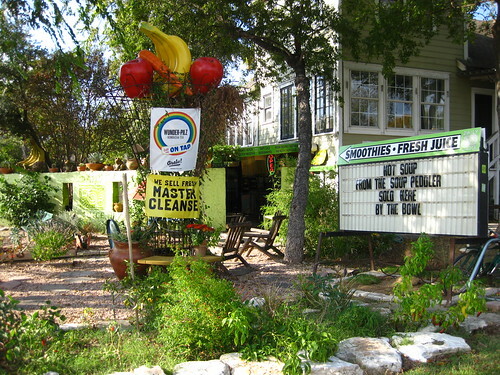 This entry was posted in Austin and tagged Austin, Daily Juice, juice, Juiceland, smoothie on February 9, 2012 by lazysmurf. This breakfast empanada from the Fair Bean coffeeshop is one of my most favorite things to eat in Austin. In fact, it made my top ten list in 2010. Over the years this golden pastry has become even better tasting and more elusive. I don’t know if they don’t always have them because more people are buying them or if they just don’t make enough but I stop there all the time and usually I get lucky. For the couple minutes that I eat my empanada I am completely in a state of bliss, like a hippie at a drum circle. When I learned that they had recently changed the recipe I started reeling with overwhelming disappointment. Why was this happening? How could I stop it? Should I start a twitter campaign or would it be better to call the manager? It’s true, my first instinct is always to overreact. I’m sensitive! I tried a bit of the empanada, which had always been just sausage and potatoes before, and I thought, “are these carmalized onions”? “Are there slices of almonds”? I had another one the next weekend, and I can now tell you, yes it is an improvement on perfection. This is the flakiest crust in town, plus they have Horchata Lattes! And Celeste’s Best Cookies! I love the Fair Bean. 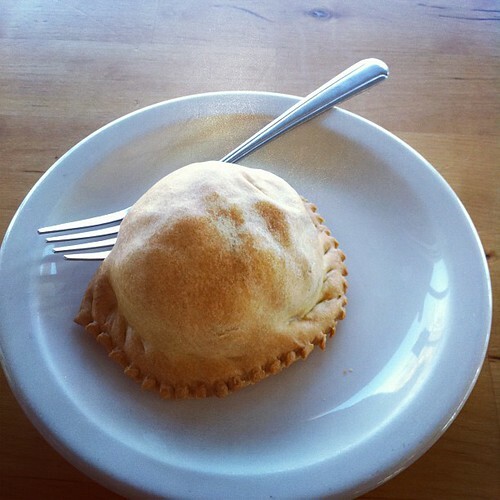 This entry was posted in Austin and tagged Austin, breakfast empanada, coffeeshop, Fair Bean on February 2, 2012 by lazysmurf.